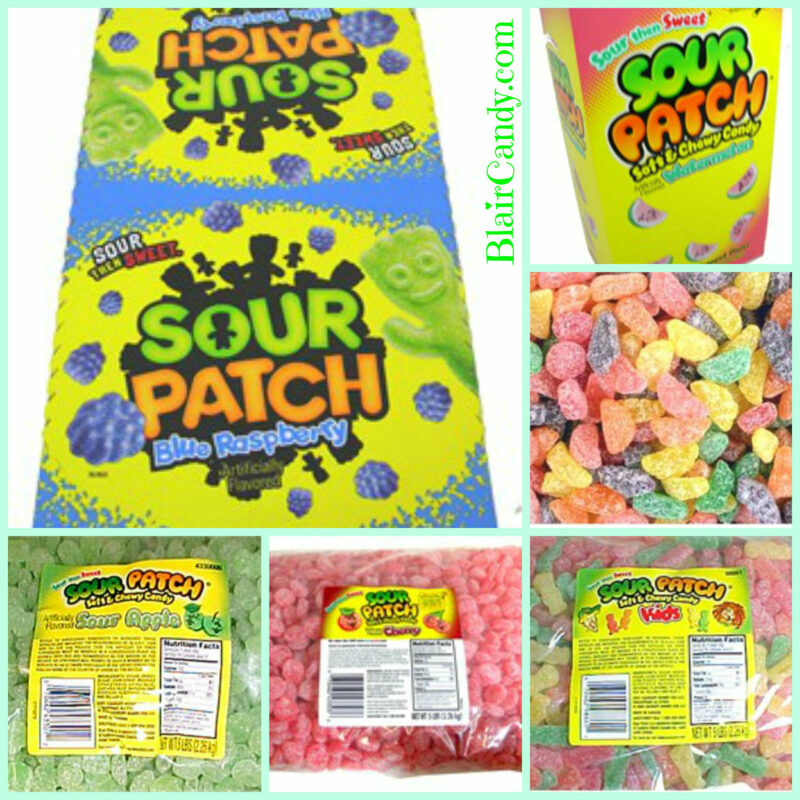 Spotlight on Sour Patch Candy: A Fiesta of Fruity Goodness! There are many high-profile families whose names we are all quite familiar with, from the Clintons to the Kardashians. 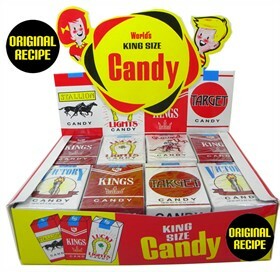 But there’s another family flying a bit below the radar that you have probably been enjoying for many years without giving much thought to their sweet and sour stronghold on the candy corner. Yes, they have been earning devoted fans and followers, making enough fuss to get noticed, but keeping things scandal-free to avoid the paparazzi. What is this fiercely powerful family, you ask? 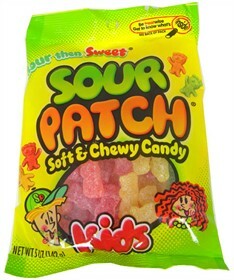 The Sour Patch family of treats, of course! Sour Patch Blue Raspberry: There’s nothing these bumpy, berry-flavored candies love more than a good party! If anyone is going to get the Sour Patch family on the cover of the tabloids, it’s probably Blue Raspberries. But they aren’t too concerned about this wild child, because just like all the others, they’re as sweet as they are sour. Sour Patch Watermelons: If the ‘Kids’ were kept out of the competition, these would be the strongest contender for ‘Most Popular’. Wedge-shaped watermelon-flavored wonderfuls, they’re my personal Sour Patch top pick. Sour Patch Cherries: These ‘pop ‘em in your mouth’ sour cherry gummies are as tasty as cherry candy gets, with a fresh, fruity flavor that lasts from sour beginning to oh-so-sweet finish. Even people who aren’t big fans of cherry candy keep coming back for these, as their flavor isn’t overpowering in the least. Sour Patch Fruit Salad: These are the crowd-pleaser of the Sour Patch family, with a little something for everyone! Flavors include orange, cherry, lemon, lime, watermelon and grape. Eat two at a time for fun flavor combos, or let each shine on its own. There’s no wrong way to eat this marvelous mix! Create a Candy Cake with Candy Sticks, Sour Patch Kids and More! Typically, when I’m looking for a fun and unique recipe that incorporates candy, I find myself searching through the oodles of inspiration the internet offers. After all, there are far more creative people out there than me, and if they’re willing to share their creations, who am I to not take them up on the offer? But this morning, as I sat on my front porch and enjoyed the sunshine and warm air, a little inspiration of my own struck. And now it’s my turn to pay it forward by throwing my little idea out into the universe! Don’t get me wrong – for as delicious as some animals seem to find grass, it has never struck me as a scrumptious snack. That said, I do love me some sprinkles! My idea – which can be totally customized to include any number of additional delights – starts with a rectangular cake in your favorite flavor, generously coated with a layer of green icing. You can allow the green icing to serve as the grass all on its own, or add extra texture with green sprinkles. From Sour Patch Kids to gummy bears, there are countless delicious inhabitants for your yard to consider! Other tasty options include gummy worms, mini gummy butterflies stuck to the fence with a dab of icing, and/or anise bears or cinnamon bears. If there’s room on your cake, you can even make a ‘swimming pool’ with blue sprinkles and fill it with gummy octopi, assorted Swedish Fish, Gummi Peach Penguins and more.